Triple world Superbike champion, Jonathan Rea celebrates winning the Cornmarket/ Enkalon Irish Motorcyclist of the Year at the awards in Belfast. Rea was presented with a new trophy as well as the Joey Dunlop award to mark his three world titles. Jonathan Rea received a standing ovation as the triple World Superbike champion was named Cornmarket Irish Motorcyclist of the Year for the third successive time on Friday night in Belfast. At a sold-out Crowne Plaza Hotel, Rea was given a rapturous reception as he took to the stage to receive the prestigious accolade. The 30-year-old made history last year when he became the only rider to win the World Superbike title three years on the trot. Rea was presented with a newly commissioned bespoke trophy created by the same company responsible for making the gongs handed out to the winners of Master Chef and the Pride of Britain Awards. The Enkalon Club’s famous Joey Dunlop trophy, bearing a mini replica of the Ballymoney racer’s iconic yellow helmet, has been retired and Rea has been given the famous accolade for keeps in recognition of his three world titles. He has now joined Isle of Man TT legend Joey as the only riders ever to have claimed the honour in three consecutive seasons, with Dunlop – who won the award eight times in all – sealing a trio of successive wins from 1983-1985. A massive odds-on favourite for the feature award, Rea was a clear winner as expected following the public vote, which was overseen by a panel of judges. 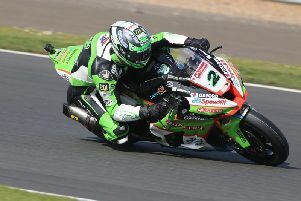 Clogher’s Keith Farmer, who won the British Supersport title last year, finished second while British motocross champion Graeme Irwin was third. It is the latest honour for Rea, who received the MBE at Buckingham Palace in November and finished as the runner-up in the BBC Sports Person of the Year. His father and former TT winner Johnny, was inducted into the RPS Group Hall of Fame, while the world champion’s crew chief, Pere Riba, received the Kawasaki Outstanding Achievement Award. It was a special night also for Carrickfergus man Glenn Irwin, who picked up two awards. The British Superbike rider received the Greenlight Special Recognition Award following a terrific year in 2017, when he secured his maiden BSB victory and won the feature Superbike race at the North West 200 at his first attempt. The PBM Be Wiser Ducati rider was involved in an epic battle with record-holder Alastair Seeley around the Triangle circuit. Irwin also won the ill-fated Macau Grand Prix in November. The NW200 showdown was named the A. McLean Bookmakers Race of the Year, pulling in 77 per-cent of the public vote. Peter Hickman was crowned IFS International Road Racer of the Year after a memorable season that included five wins from five starts at the TT, plus a treble at the Ulster Grand Prix. Hickman is currently in Australia for the Phillip Island Classic meeting but a specially filmed message from the English rider was shown last night.